. Improved cleanup : "DOM STORAGE"
. privazer.exe CLEAN "your path to a custom ini file"
. Added "Shellbags AnalyZer + Cleanup"
- Fixed issues : on XP, not able to select "automatic cleanup"
. Fixed issues : scheduled cleanups asking user input after PrivaZer update.
. Improved option : "Empty Without a Trace"
- New command line : "-silent"
. Improved cleanup : "last session"
- Improved cleanup : "CHROME Plus"
- Improved option : "Erase all indexing"
- Improved cleanup : "Program files"
- New option added : in "Getting started"
- Improved option "Close when completed"
- Improved "check for updates"
. "Close PrivaZer when finished"
- Improved cleanup : "additional folders"
. 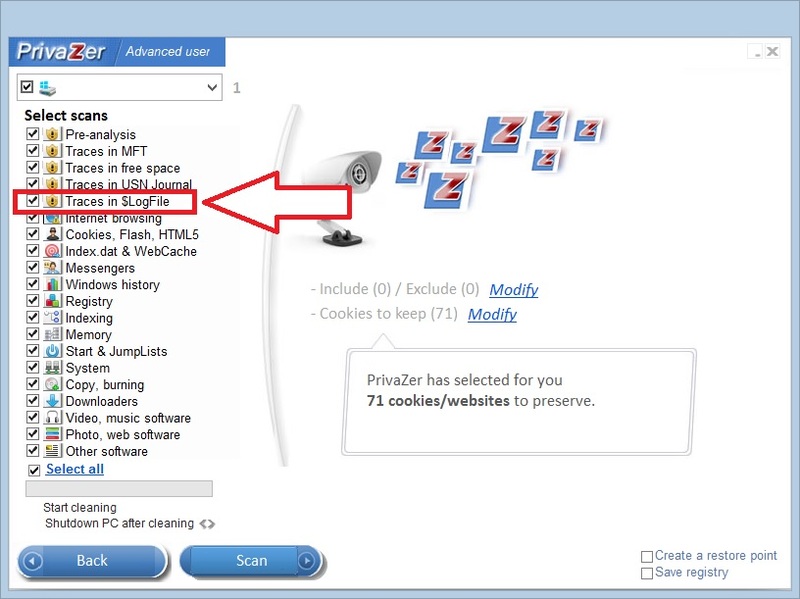 "Clean my internet traces in 1 click"
.New option added : "restore point creation"
. New option added : "save REGISTRY"